For the last 12 years that I’ve been practicing spinal medicine and spinal remodeling one of the most common statements I hear is that spinal degeneration and arthritis are normal for old age. This is not a true statement, the truth is, they are very COMMON, but not NORMAL. Our spine’s were designed to be in a certain alignment and if that alignment is maintained, barring repeated traumas or auto-immune disease, should last at least a hundred years or more. There is no reason for it not to, however, much like the tires on your car, if it is out of alignment, it will experience excessive wear and tear, which is what results in the development of bone spurs, loose weak ligaments, disc herniation’s, disc degeneration and excessive muscle tension, aka muscle spasms. Things like bone spurs, which are nothing more than the hardening of the ligaments between the joints of the spine, are our bodies attempt to prevent further damage. However, in reality, it only slows the progression and causes other problems like atrophy, inflammation, dehydration and malnourishment of the disc and joints. This leads to weakening of the discs, bones, ligaments and muscles. When these tissues get weak they tear or break and in the case of the discs, allow the jelly like material in the middle, the Nucleus Pulposis, to squeeze out, which is know as a Disc Herniation. Furthermore, as the discs dry up and atrophy the space between the bones, aka vertebrae, and around the nerves, decrease and become irritated and pinched. Anywhere along their path you will develop pain symptoms of one kind or another, often starting as localized pain and resulting in pain along the nerve into either the arms or legs, aka radiculopathy. Headaches, numbness and loss of function in those limbs and organs will result. I do need to point out that headaches can be cause by other things, but I want you to be aware that headaches are a very common symptom of this condition. The good news is, there is a way to stop, slow and even reverse this process, Spinal Remodeling! It doesn’t matter if you’ve already been to a chiropractor or had spinal surgery, if you’ve ever experienced low back pain, neck pain, headaches, pain in the arms and legs or have been diagnosed with arthritis or a disc herniation. 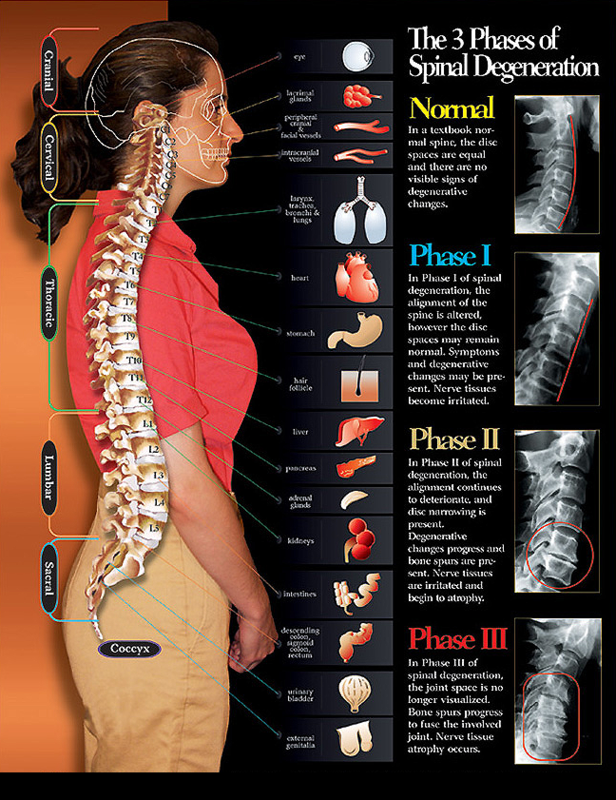 You will benefit from Spinal Remodeling. My goal as a Spinal Remodeling Specialist in the Wichita, Ks area is to address this root cause of spinal arthritis and degeneration at the structural level so that it can be stopped once and for all.